Sixteen years ago massive demonstrations took place all over the world to speak out against the invasion of Iraq. 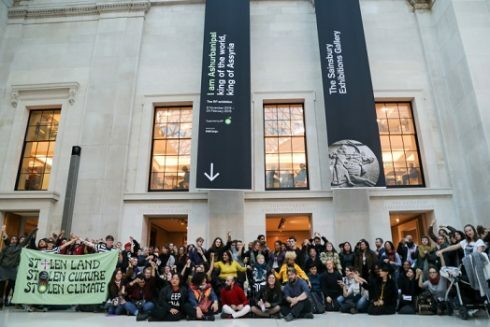 Now, in February, there will be what is expected to be the largest protest that has ever taken place inside The British Museum in its entire 260 years history. In 2003 the United State of America joined by the United Kingdom and other allied countries attacked Iraq to overthrow the Saddam Hussein government. This war forced many Iraqis family to flee abroad and the people who remained, to live in difficult conditions. Despite that tragedy, The British Museum is organising an exhibition, sponsored by the giant corporation BP, “I am Ashurbanipal: king of Assyria, king of the world”, that is featuring many ancient artefacts coming from what, today, is Iraq. BP or not BP? is an organisation which is working to oppose the BP corporation, considering it responsible for the climate crisis and guilty of criminal activities. 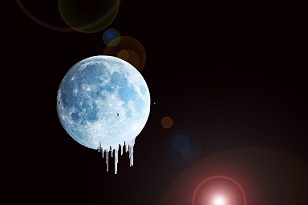 They are organizing a mass creative protest: “No War, No Warming! Takeover at the British Museum”. The group has given different reasons for creating the protest. 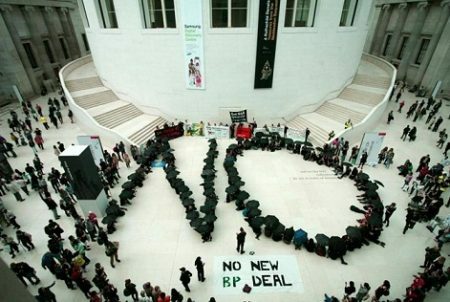 First of all, they believe that while The British Museum is promoting BP they are helping them to cleanse their image, make new oil deals and hide their true activities. 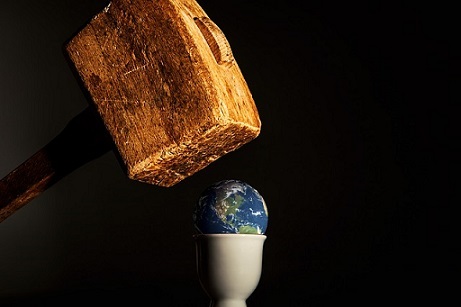 This organisation doesn’t consider it acceptable anymore for museums and gallery to promote companies and corporations that are believed to be responsible for the climate crisis. According to the activist group the Assyrian exhibition includes some looted artefacts, coming from Iraq. They also point out that this is just a sample of cultural objects stolen from communities around the world, and that now, the British Museum, is coming under increasing pressure to return those items to their countries of origin. Another reason why this organisation is demonstrating is that Iraqis are already protesting in their county against the detrimental effects, that they can see, on water pollution and health, caused by oil extraction. Despite the doubling of the country’s oil exports since 2003, most Iraqis are not benefiting from the profits, and many people still struggle to get access to basic services like electricity and clean water. Furthermore, for many, BP is one of the companies responsible for the climate crisis. It is continuing to make things worse by “lobbying against climate laws, blocking clean energy and pushing for ever-dirtier sources of fuel”. They also added that the effects are already visible in the Middle East, where conflicts are sustained, livelihoods are damaged, and people are getting forced to leave their native country. Now, they are inviting everyone who cares about climate justice, peace, social justice and international solidarity to join them to say to The British Museum: “Drop BP! Justice for Iraq! No more oil logos on stolen artefacts!”, launching the hashtags: #DropBP #Iraq #Solidarity #ClimateJustice #FossilFreeCulture #Repatriation. On the day of the takeover they will be joining other groups, transforming the space with song, movement, storytelling and other surprises. The event will be family-friendly and they want to make it as accessible as possible for all.